Understanding the energy systems becomes crucial because of the need to train in a specific manner to improve in a certain event. First, recognize that all the energy systems are working together all the time. After you have assembled your resume and sent it out, you will (you hope) be called in for an interview. The purpose of a well-written resume is to give a potential employer some background information and impress them enough to give you an interview. The personal trainer has a significant responsibility to the client, not only because he or she has a contractual obligation to the client but also because the client is depending on the personal trainer to reach the goals that were set in the beginning of the program. 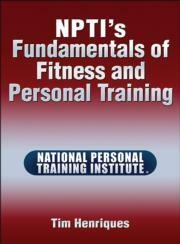 NPTI’s Fundamentals of Fitness and Personal Training makes the principles and theories of fitness accessible for all readers. Written in a conversational tone with real-life examples, this text helps students understand how the body works and responds to exercise. Readers will learn how to create exercise programs that allow their future clients to accomplish individual fitness goals. This book combines technical detail with practical application in an engaging manner. Anatomical illustrations and photos provide further guidance on the science of personal training, complete with coverage of specific muscle systems and how to train them. Extensive information on essential nutrients, coupled with guidance on helping clients burn fat and build strength, helps future trainers take the sessions beyond simple workouts. Stories and examples lend insight into the scientific concepts, helping students to understand more complex topics. Legal considerations, including how to assess and classify clients and minimize risk, prepare readers for the realities of a career in personal training. Step-by-step coverage of exercise program design takes the guesswork out of developing workouts and helps readers modify programs for special populations and clients dealing with injuries. Sample workouts designed by expert personal trainers cover key fitness training concepts and offer unique training ideas to keep exercise fun and effective for clients. Study questions at the end of each chapter help students assess their understanding of the material, and online access to a list of more than 3,000 references extends learning beyond the classroom. An instructor guide and presentation package plus image bank are available to instructors, helping them explore concepts from the text in the classroom. NPTI’s Fundamentals of Fitness and Personal Training has been endorsed by the National Personal Training Institute (NPTI), the nation’s largest system of schools devoted to personal training education. NPTI’s mission is to prepare students to become personal trainers and fitness professionals. NPTI strives to provide a high-quality education experience that each student values and would recommend to peers. Students in professional school programs for personal training or application-based undergraduate programs; reference for personal trainers and those interested in fitness and training. Tim Henriques has been with the National Personal Training Institute (NPTI) since its inception and serves as the director of NPTI Virginia, Maryland, and DC. Before working with NPTI he was a full-time personal trainer, working with the companies One to One Fitness and Fitness Image and Results before running his own business. He continues to train clients and work with athletes outside of NPTI as well as write and lecture on health and fitness. Henriques has been competing in powerlifting for two decades and has made several notable accomplishments in that sport. He was a collegiate All-American powerlifter and set many state and national records. He set the Virginia state record for the deadlift by lifting 700 pounds at a body weight of 198 pounds. He set the national record for the strict curl in 2013. He currently coaches a powerlifting team called Team Force, who won the Federation Championships in 2011 and 2013. He has also competed in arm wrestling and strongman competitions. He is lifetime drug free. Henriques earned his degree in kinesiology, along with minors in coaching and psychology, from James Madison University. He was born and raised in Fairfax County, Virginia, where he resides with his wife, Christina; their boys Nathan, Ryan, and Collin; and their dog, Pongo. The National Personal Training Institute (NPTI), founded in 2000, was created to raise the standard in personal training education. NPTI developed a comprehensive system to provide the education to ensure that personal trainers were not only certified but also qualified. NPTI is an actual school for personal trainers—students attend classes, listen to lectures, complete homework, take tests, and participate in extensive practical-based, hands-on workshops. Students are taught both the art and science of personal training. NPTI currently has more than 30 campuses throughout the United States and Canada. Thousands of students graduate from NPTI every year and go on to work in commercial fitness settings, physical therapy centers, weight-loss clinics, personal training studios, and collegiate athletic centers; many graduates go on to operate their own personal training–based businesses as well. All ancillary materials are free to course adopters and available at www.HumanKinetics.com/NPTIsFundamentalsOfFitnessAndPersonalTraining. Contains a sample syllabus, chapter outlines, and teaching ideas for instructors for each chapter in the text. Contains PowerPoint slides that highlight important material from the book. The image bank contains all figures, tables, and content-related photos from the text, sorted by chapter. For convenience, a blank PowerPoint template is also provided so instructors can quickly insert images from the image bank to create their own customized presentations.